So, we are back at home and the baby is recovering well, much thanks to all of you who sent in your well wishes! 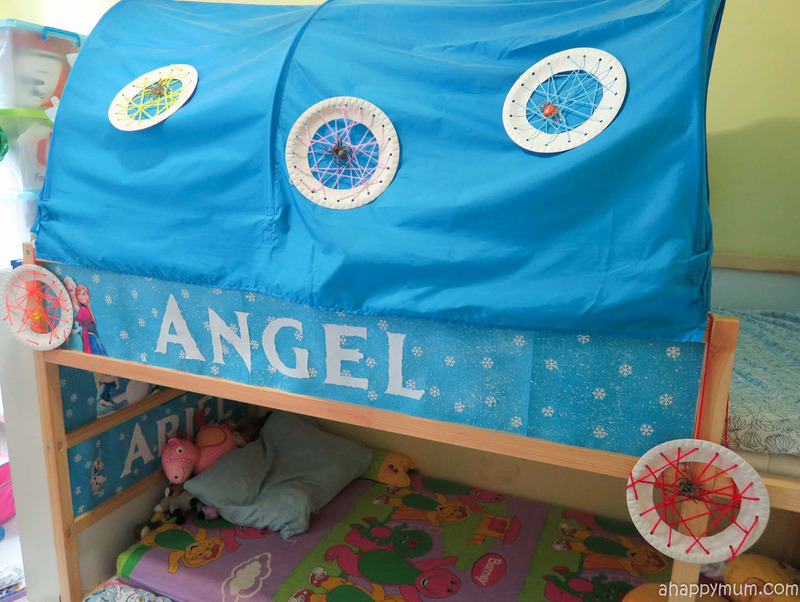 Life has gotten very busy once again because aside from looking after the three kids, I'm also trying to declutter the house, pack some belongings, shop for new furniture and meet up with a handful of sponsors for our new nest. I can't wait to see how the house will turn out, but till then, it's one step at a time and I believe I'm in for quite a hectic period since the hubby rarely has any pocket of free time to help with the packing. 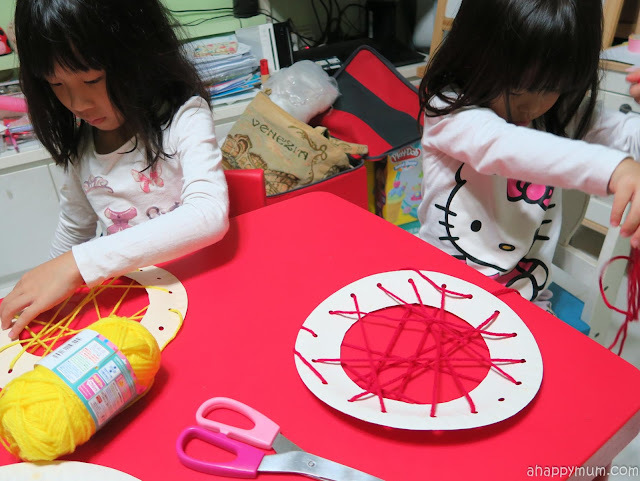 Nonetheless, I'm still trying to squeeze in time to do some simple crafts with the girls and keep the Creativity 521 series going. I was going through some of my craft supplies, which amounts to several boxes full, and found so many balls of yarn which have been accumulated over the years. 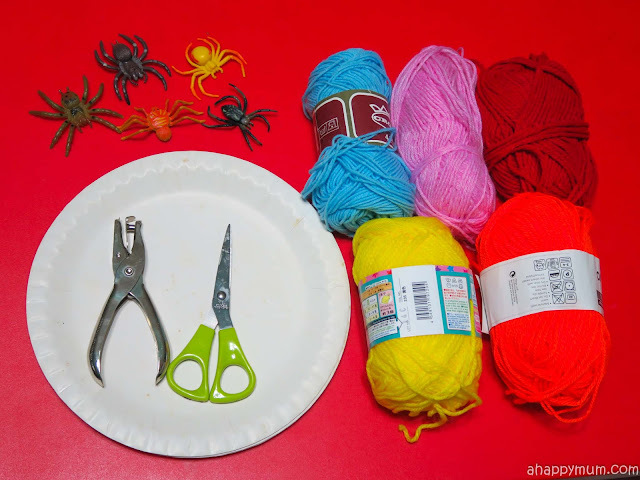 So, now that Halloween is coming, I reckon we could do some simple and fun-filled crafts just to spice up the house a little. In today's post, I'll be sharing about our DIY Halloween Cobwebs! 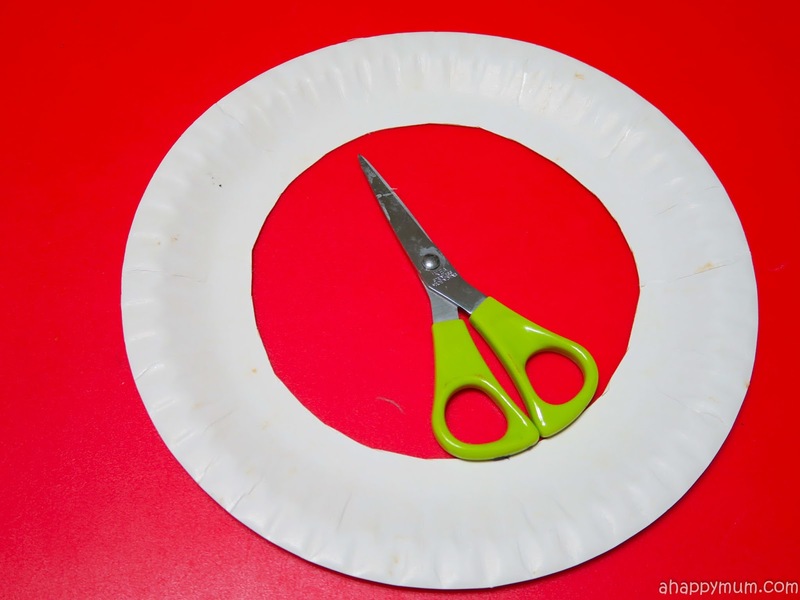 Firstly, cut out a round circle in the middle of the paper plate to make a hole. 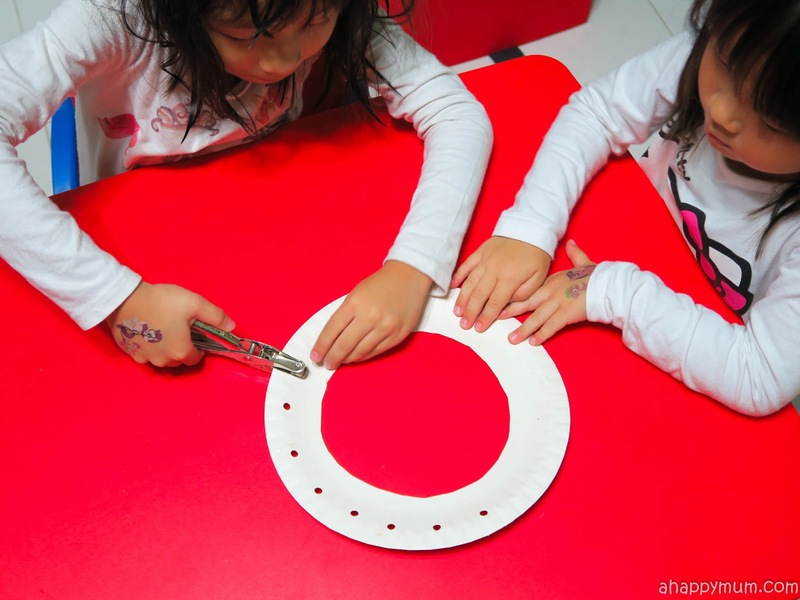 Using the single hole puncher, make holes along the border and keep them evenly spaced. Take one end of the yarn and start to weave! Basically, just go in and out, making sure that the yarn goes across the middle of the plate, to build up your cobweb. I initially thought this was as easy as could be and we would take just 10 minutes or so to complete. 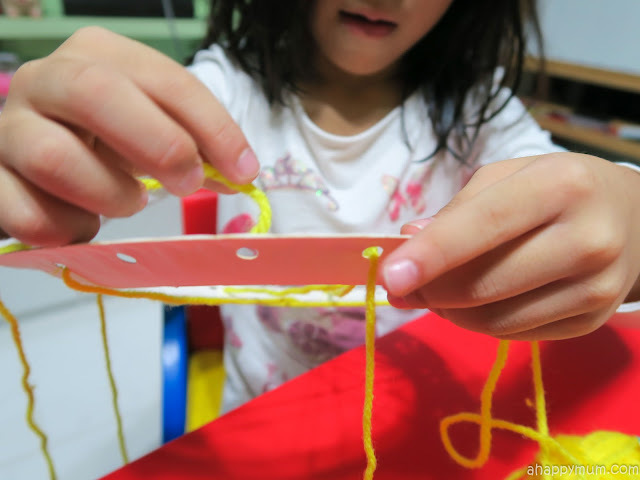 It ended up that we spent over half an hour because the girls would entangle their yarn, or themselves, or get confused about whether to go in or out of each hole, so I had to step in to help free them up and guide them. Well, that's the point about doing all these crafts right? To have a bonding session with my kids while we learn and laugh at the same time. I honestly thought this was a good craft to teach my big girl about being patient too! 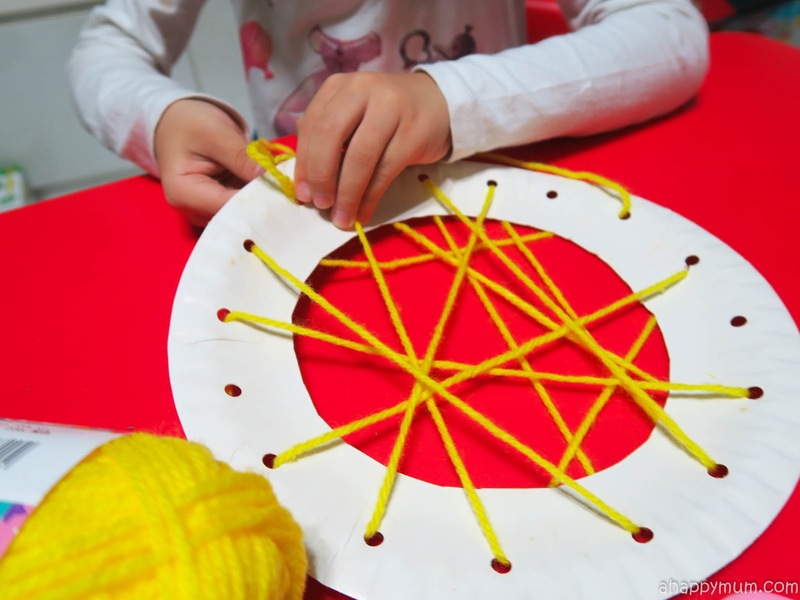 Once you have used up all the holes and are happy with your cobweb (remember, there's no right or wrong, no pretty or ugly), tie the end to a yarn beside it and make sure the web is secure. Make a loop of yarn at one end if you are planning to hang it up. For the final touch, add in a spider toy to make it more real (I used sticky tape to keep the spideys in place)! And we are all done! Ta-dah! Not too bad for 30 minutes of crafting, right? 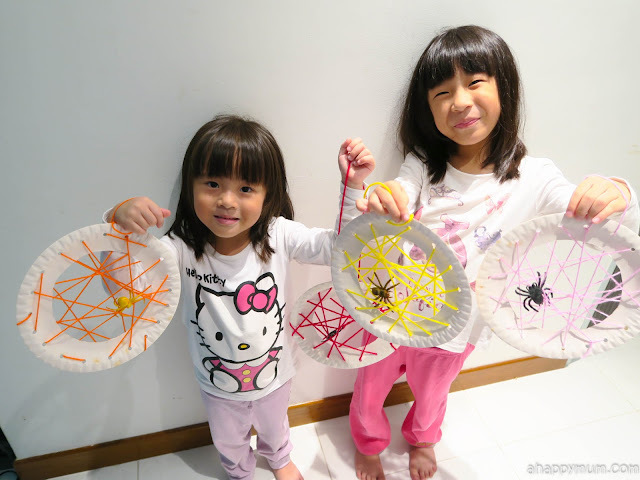 The girls insisted that we have five cobwebs and five spiders, so that there's one for each of us, including Papa and Didi, which I thought was rather sweet of them. So yes, the girls are thrilled to be sleeping in a room with spiders and colourful cobwebs for now and I've a feeling we're gonna have fun playing pretend in their room tonight. Till the next Creativity 521 where I'll be sharing more about an upcoming birthday celebration for the girls!